A few short years from now, a large swath of grass at Los Olivos Park could be covered with cultivated rows of corn or wheat, large planter boxes growing a variety of edible herbs and vegetables, and a small restaurant and art & education center. 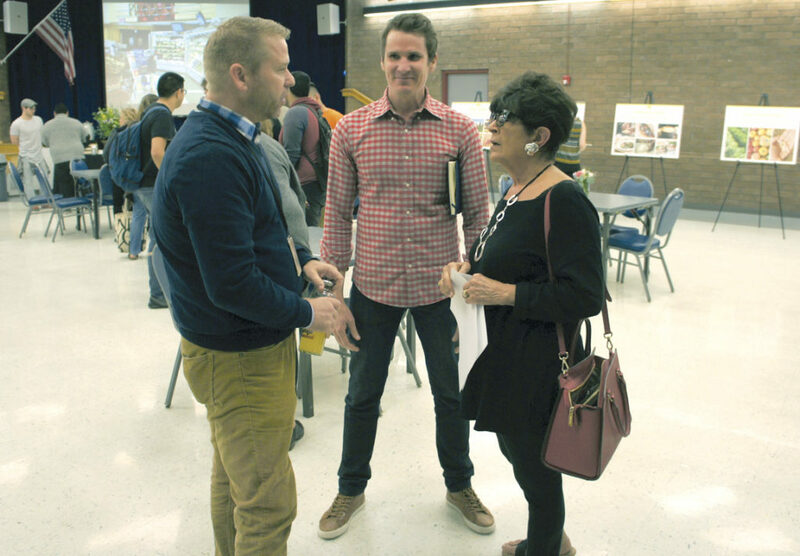 Paul Mangan with the Phoenix Parks and Recreation Department (left) and Aric Mei, a partner in the proposed Farm at Los Olivos, discuss the project with neighbor Patricia Hawkins during an open house about the project held at the Devonshire Senior Center on Jan. 11 (photo by Teri Carnicelli). This is the vision of Aric Mei and his business partner, Matt Moore, who are hoping the Phoenix Parks Board will get the ball rolling on this ambitious project by approving the proposal at the board’s March 22 meeting (**date changed from Feb. 22). “The Farm at Los Olivos is a new proposal that we are working on with the city of Phoenix Parks and Recreation Department. The vision is to create a new farm, education, and food experience,” explains Mei, who is co-owner of The Parlor restaurant in Central Phoenix. Mei is no stranger to urban gardening, as there is a small garden that lines the entryway to The Parlor. They use the vegetables and fresh herbs grown in the garden for the eatery’s specialty dishes. The Farm At Los Olivos is envisioned as a 2-acre working organic farm that will include a market, produce stand and full-service dining. “This groundbreaking project will help the City of Phoenix Parks Department take a big step towards its mission statement to ‘build healthy communities through parks, programs, and partnerships’,” Mei points out. The restaurant or “concessions” component is important because it is the revenue-generating portion of the plan, which will help pay what essentially will be a long-term lease on the park land. A portion of the income generated through the eatery will go back to the Parks department, specifically earmarked for Los Olivos Park, located at 2802 E. Devonshire Ave. Some amenities at the 28-acre park, such as the 9-hole Frisbee Golf Course, will not be eliminated but may be reconfigured. The 4.5-acre urban farm will be located at the north and west end of the park, to take advantage of the access off 28th Street and existing parking there. At an open house on Jan. 11 at the adjacent Devonshire Senior Center, more than 20 students from the nearby Camelback Montessori High School came to learn about the project, which will be just a few blocks away from the school when completed. Patricia Hawkins, who sometimes brings her grandchildren to the park, calls it a “win-win,” noting it will improve the amenities at the park overall while providing a dedicated source of income to the park. The educational aspect of teaching people of all ages about growing their own food, even in the middle of a large city, also appealed to her. “We need something like this in this urban world,” she said. The Phoenix Parks Board is tentatively scheduled to vote on the proposed Farm at Los Olivos at its meeting set for 5 p.m. Thursday, March 22 in the City Council Chambers, 200 W. Jefferson St. To confirm this item is on the agenda, visit www.phoenix.gov, select “Other Public Meeting Notices” under City Business, and find the posted agenda 24 hours in advance of the meeting. If approved, it then goes through the city’s normal process to execute a public/private partnership, such as plan review, design approval, etc. The partners anticipate 9-12 months before any kind of groundbreaking, and likely at least 2 years before an official opening. Send your comments about this proposal, to be shared with the Phoenix Parks Board in advance of its meeting, to Nellie Ramon, Management Assistant I, Parks and Recreation Department, at nellie.ramon@phoenix.gov.